The ‘Inside Anfield’ videos that Liverpool release are always so interesting. You get to see what goes on in the tunnel before, during and after games – including the commiserations and celebrations. 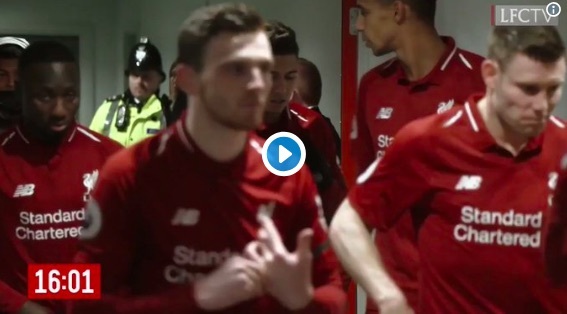 This clip has surfaced from the weekend victory over Crystal Palace, that shows Andy Robertson giving Naby Keita both encouragement and tactical instructions just before the second-half. Keita is listening and nodding intently; as the Guinean was fielded on the left flank and had to link up with Robbo, our left-back, on plenty of occasions. The summer signing has not yet mastered English, so we can only hope he understood Robbo’s Scottish accent! Regardless, it’s great to see our 24-year-old taking on the role of leader in this situation to help a player who has struggled to adapt to the pace of the English game, but also the squad, since his arrival from Rb Leipzig. It wasn’t that long ago that Robertson was on the bench with fans asking questions about his arrival, and now he’s one of the best defenders in Europe. With the support of his team-mates, Keita can make similar strides.